Open Wednesday-Mondays, 10am-7pm. Closed Tuesdays. There are often sensitivities when it comes culture issues – and Chinese BBQ is no exception. With a contentious battle between T&T Supermarket and the CRHA over the proper storage temperature of BBQ meat, the entire culture of BBQ meat is being called into question in Calgary. The health authorities say keeping meat at lower than optimal temperatures contradicts food and safety guidelines, because of potential bacteria regrowth. Culturally, BBQ meat has always been stored at room temperature, or below the guideline of 140oF temperature. It tastes better that way. Bacteria!? Oh the horror! Anyway BBQ in Calgary is available in many locations – but most familiar to me is BBQ Express. BBQ Express actually has a couple of locations – with another branch in Edmonton, but I do not consider them a chain. 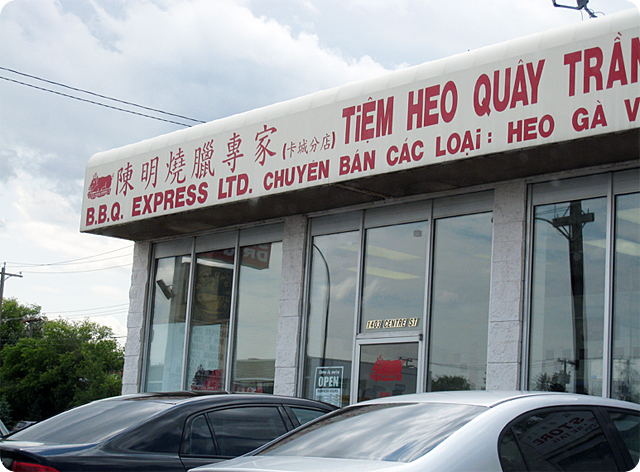 Family owned and run, they’re a Vietnamese family that has been serving up takeout-only BBQ for years. Like most BBQ places, they serve the standard assortment of meat. 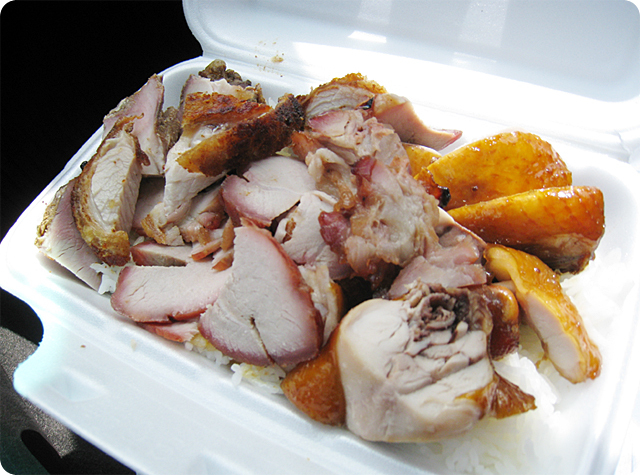 BBQ pork, chicken, roast pork,duck, chinese sausage. There are also lots of other odds and ends that they sell – pig ears, feet, cartilage, etc. No piece of the animal goes wasted. However, while they mostly have a thriving business in selling lbs of meat, they also offer one of the best lunch specials available. The BBQ Express Lunch Box. For $6 (a much better deal when it was $4.50 just 18 months ago), you get a styrofoam box of rice, and your choice of two meats and sauce. It’s an extra 50 cents for BBQ duck. My typical order is BBQ pork, roast pork, and chicken. I add an extra meat for a couple bucks. What is there to say. The BBQ is fresh. Comes out throughout the day. Their BBQ Pork has both fatty, and lean cuts. I prefer the fatty. It is a touch sweet, but tender, and moist. Much better than Gee Gong or Happy Valley, but not the best I have had in the city. The chicken is decent – but everywhere can do a decent chicken. The big difference maker? 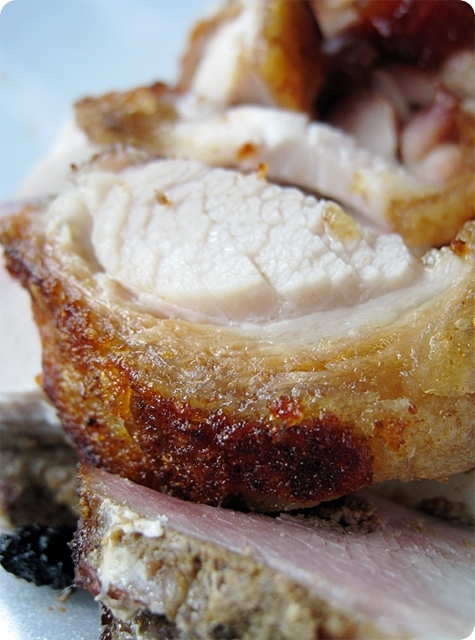 The roast pork. It needs to be tender, and succulent. With a super crispy skin, with great crunch and a well seasoned rind. It is. This is the meat i like best at BBQ Express. Look, my thoughts are Chinese BBQ is darn good. As Almattone said, eating requires various levels of intestinal fortitude. And really, I have never gotten sick eating Chinese BBQ. Forget the meat storage controversy – Asians have been eating this way for thousands of years. Back when some of our ancestors hadn’t even discovered fire. I figure they probably know a few things we don’t. However, i am sure we can all agree – it is inexpensive and tasty stuff! And who doesn’t like that?